If for some reason in the last year or so you have managed not to crack open a car magazine, browse a single automotive site on the interwebs or Google the word “Porscheâ€, allow us to enlighten you. They’ve made a new sedan called the Panamera, and in the few short months since its unveil in Shanghai its aesthetics have managed to draw more criticism than George W. Bush’s entire second term. And while it’s true that the car’s hatchback-esque fifth door and high roofline conspire to create an unconventional profile, once inside the design makes a lot more sense, providing an open and luxurious yet sporting atmosphere. But when the world’s greatest sports car builder goes and does a sedan, do you really care how it looks? The best way to convert a nonbeliever – as has always been the case with Porsches – is to throw them in the driver’s seat and let the car’s abilities do the talking. That’s when the Panamera floors every other offering in the segment with the roundhouse kick they never saw coming. Officially billed as a Gran Turismo – or cosseting long-distance hauler if you don’t speak automotive geek-lish – under this cloak of luxury hides a car with the dynamic resolve one would expect from the Porsche brand. At the same time, four very posh individuals would feel at home just cruising along at 120 mph on the Autobahn… or, if jail time isn't your stick, somewhat slower than that here in North America. 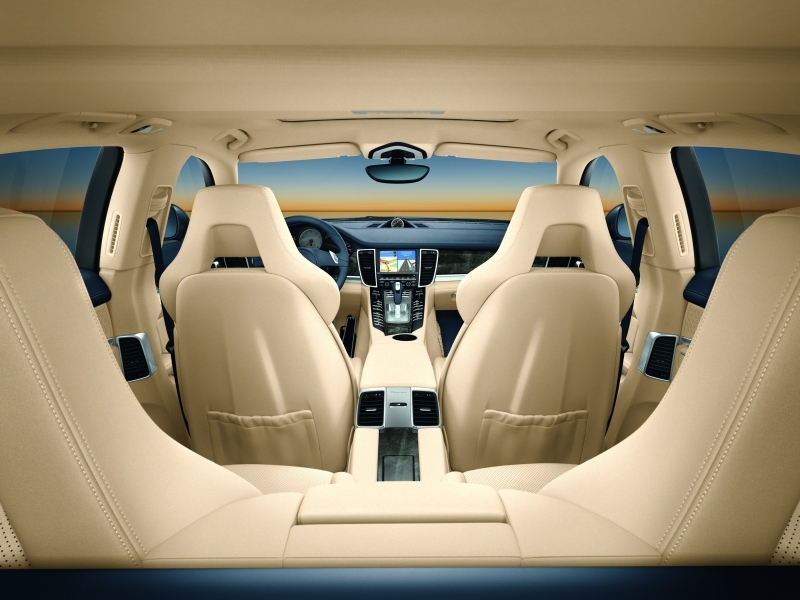 These multiple personalities are what make the Panamera so great. While the Panamera is perfectly happy trudging along as a docile executive sedan, it can switch its behavior in a second, delivering a feral V-8 induction note, pounding through gears in the blink of an eye and delivering plenty of feedback through the chassis. Yet the ride remains supple and the interior is sleek and luxurious, making quick work of long distance journeys. Ever taken a gander at a Porsche options list? They have the depressing ability to make your hard earned disappear faster than a divorcee with an open line of credit. The Panamera’s other shortcoming is its PDK dual-clutch manual mode, not because there is an issue with the shifting itself – the response of the gearbox is fantastic – but rather the paddles used to activate each shift. Just as in the 911, the rocker switches need to be pushed for upshifts and pulled for downshifts, which isn’t overtly logical. 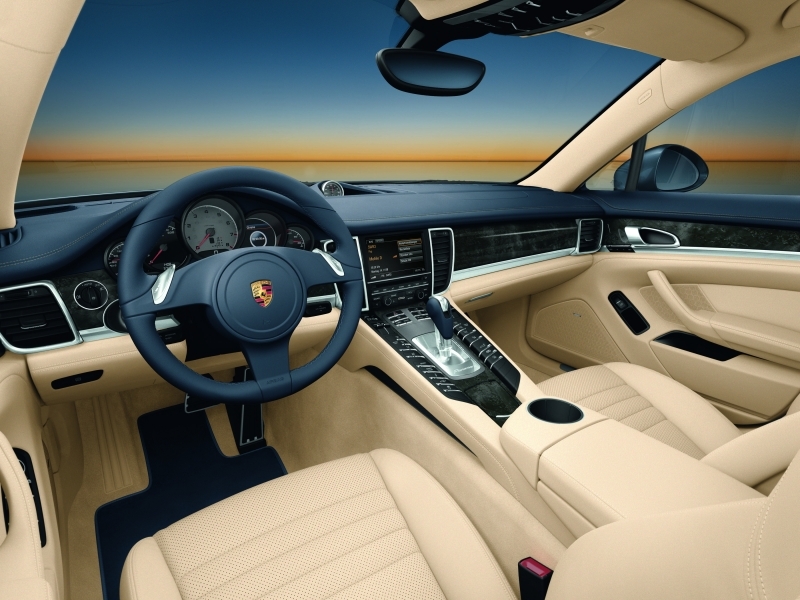 Massive grip and surefooted poise are at the core of the Panamera experience. The variable power assist steering is extremely light at parking lot speeds but weights up nicely once up to speed. It doesn’t quite have the transparent steering of a rear-engine 911 – that’s difficult to duplicate when you jam a 4.8-liter engine where there is typically empty luggage space – but even without it the helm never feels twitchy or uncertain. Jump on the throttle and the V-8 wastes little time getting the hefty Panamera up to speed (0-60 takes 4.8 seconds in the 4S), all the while piping sultry induction noise straight to your cranium. Lightning-fast shifts are the norm with Porsche’s PDK dual-clutch automatic, though the push-for-up, pull-for-down logic of the buttons will instantly lose the motorsports obsessive amongst us, as will the Tiptronic-esque console shifter (they’ve put fixed paddles in the new 911 Turbo, so here’s hoping). Luckily the sport mode is so fantastically telepathic that you’ll never need to bother shifting the car on your own. Slight understeer is present through the corners, but go in on the brakes – which, like all Porsches, are simply phenomenal – and you can keep the nose on line before going back to the throttle. Then simply hang on as the car relentlessly piles on speed. The fact that you can take three friends along for the experience only adds to the fun. The Panamera uses a dry sump 4.8-liter V-8 engine, which makes 400 horsepower and 369 lb-ft of torque in a vocally dramatic fashion. Power is driven to the rear wheels via a seven-speed dual-clutch automatic gearbox in the S model, while the 4S uses the same ‘box but drives power to all four wheels. Clearly the 4.8-liter, nearly two-ton Panamera isn’t the most eco-friendly sedan out there, but it is the first vehicle in its class to offer a stop/start function that saves fuel by killing the engine when the car is not in motion. A 14-speaker Bose Surround Sound system with a total power output of 585 watts is available and provides crisp high tones and epic stage sound. It also happens to be $4,250 cheaper than the Burmester surround system that is also offered. Configure your car with Adaptive Air Suspension, Porsche Dynamic Chassis Control and the Sport Chrono Plus package, and suddenly you have a Panamera with an aggressive side. All three systems talk to each other, and in Sport Plus mode the car lowers itself almost an inch, increasing aero efficiency and lowering the center of gravity. Active front anti-roll bars help to reduce understeer while the air suspension works to eliminate body roll. Sport Chrono also adds a launch control function, which is a blast to show off and makes nailing 0-60 times as simple as releasing the brake. Both the Panamera S and the 4S return just 16 mpg around town, but a respectable 24 mpg on the highway, bringing combined consumption to 19 mpg. 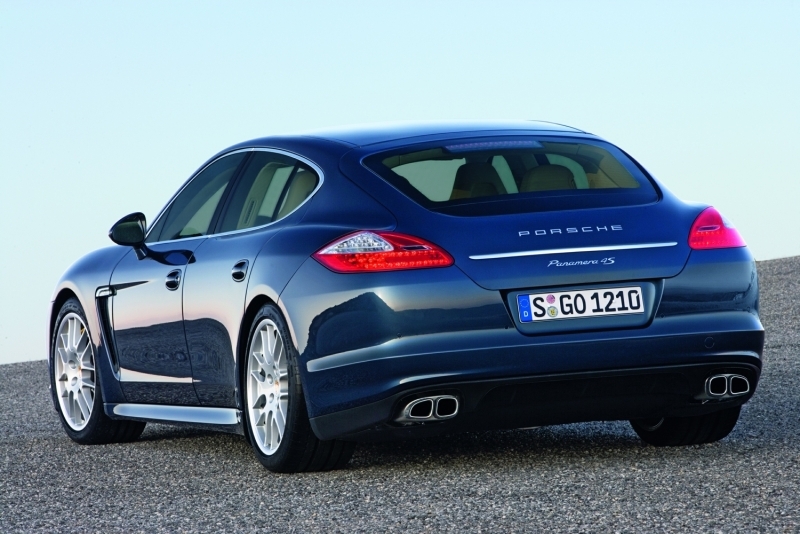 Despite its relative thirst, the Panamera is able to pull off a neat trick and avoid the dreaded gas-guzzler tax. We highly recommend springing for the full leather interior in a light color. Everything in the cabin is covered in supple, soft leather that exudes high-class quality to the touch. Backseat passengers enjoy plenty of legroom and cavernous amounts of headroom thanks to the car’s low seating position, and from the rear forward the driveshaft tunnel crescendos nicely into the button-heavy yet easy-to-use center stack. Love them or hate them, the lines of the 911 are clear in the Panamera, from its high fender lines and sunken hood to its hatchback rear door. It’s quite a large car, coming in only a few inches short of an Audi A8, but somehow manages to appear deceptively smaller despite its high roofline. When it comes to paint, you’ve got your choice of options – 16 exterior colors are available. 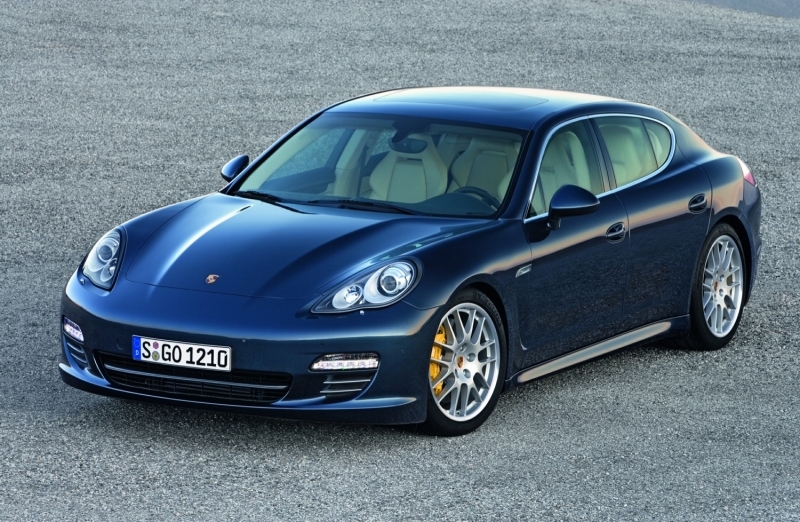 The Panamera S comes in at $89,800, while the all-wheel drive 4S will set you back $93,800. Add in a few options, which are essentially unavoidable, and most will likely top out above the $100k mark. Competitors include the equally potent BMW 750Li ($84,355), Jaguar XJL ($78.650), Audi A8L ($77.900) and Mercedes-Benz S550 ($91,600). 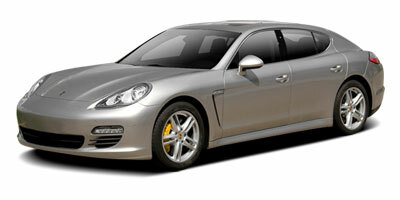 Make no mistake, the Panamera is a Porsche to its very core. Under its four-door skin lies what is simply the most capable chassis in the segment, yet when you aren’t taking it by the scruff and pushing the limit at ten-tenths, it remains an impressively luxurious tourer. Sure it might not be pretty, but then again that’s what they said when the Cayenne was released, and Porsche has certainly managed to sell one or two of those.